Why Healers Must NOT Be Nerfed! Hey guys, today I want to talk about an important topic. Recently, as many of you guys may be aware of, the upcoming Clash of Clans update had been leaked. If you are not aware of this, then you can click here to view the spoilers. Now, what I want to talk about today is one of the leaked information we had received. And that is the nerf to Healers, which may not only make Healers an useless troop but also put an end to the Archer Queen walk or Super Queen strategies. As someone who is very passionate about the competitive sphere of this game, it will leave me utterly disheartened if this was to happen in the next update. And the likelihood of this leaked information being true is very high, and so I want to take this time address this issue and possibly change the minds of Supercell, convince them that this strategy that we as a community created is something beautiful and is a godsend to this game. And so, I urge everyone who is reading this to show your support, help me or better let’s all help Supercell understand. To show your support, please give the video a thumbs up if you agree with me. And also please comment below on your opinion of this. With enough support we still have time to change Supercell’s mind. It’s a blessing in disguise that this update got leaked, so let’s not waste time, let’s work together and fight for this, show Supercell the power of millions of Clash of Clans players. After all, it us who made Clash of Clans one of the best mobile app games in the world. The Healer was once a neglected troop in the game in high level play due to its vulnerability to air traps and their healing effects being disabled by Inferno Towers. They were almost non-existent at TH10. Now the Super Queen strategy had always coexisted with the Healers, but it didn’t gain much traction until the update the made Healers invulnerable to air traps. Thus came the golden age of Super Queen farming. Now remember, the Archer Queen had a horrible A.I., which made her more eager to target walls than to walk around them. Although the Archer Queen’s AI is the not best AI, Supercell did a great job improving it. With these two important changes, it made possible for one of the best strategies in the history of Clash of Clans, the Queen walk. With her excellent range to protect Healers from the range of Air Defenses and her new an improved AI allowing her walk around the walls, rather than target them, gave way to the Queen walk strategy. This is a strategy created by us, the players. Supercell had never intended for such a strategy to happen. And from history, we know that Supercell is highly skeptical of any strategy that was not created with their intentions in mind. Use the death of Town Hall sniping as an example. Supercell openly stated that the reason for the complete removal of Town Hall sniping was simply because it was never their intention as a strategy. Now this isn’t about Town Hall sniping, so let’s get to topic. The Queen walk is not an OP strategy. It is a strategy that requires a lot of skill to fully master, and yes there are ways to stop her. If you’re a TH8. 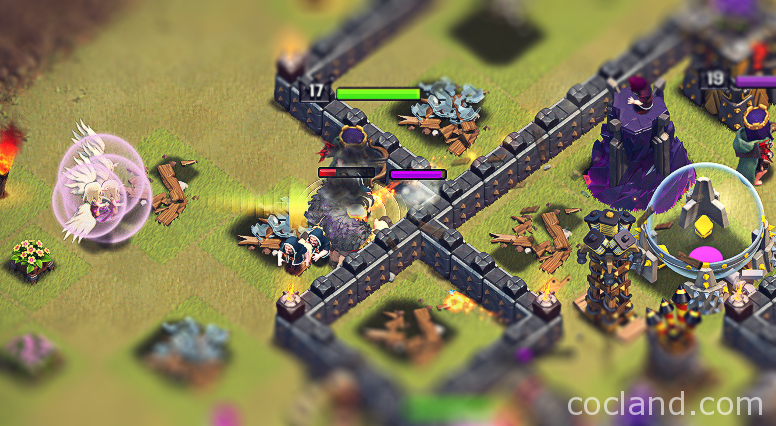 then you’re not supposed to stop the Super Queen, your base isn’t built with the intention of stopping TH9 attackers. While if you’re a TH9 player, then the level of your defenses have to be in equivalence to the level of the Archer Queen to defend yourself against her. For example, if you want to stop a level 30 Archer Queen with Healers, you’re going to need maxed level defenses. Anything less than that is not sufficient. Does that mean Super Queen is OP? Of course, it just means that either you have a bad base or your defenses have not been fully upgraded to withstand the level of the heroes. This is a big misconception people have in the game, and is a big reason why people on the forums complain about the Super Queen on the forums. A much less skilled attack such as GoWiPe will simply allow any unskilled attacker to get your all your storages, and there’s nothing you can do about that. Yet you don’t see people complaining about GoWiPe. As a defender, you are always placed in a disadvantage. This game revolves around offense, not defense. Now the biggest complaints with the Super Queen comes from many of the TH8 and new TH9 players, players who are either unable to defend against her or simply don’t have the experience of using the strategy on their own. If you watch many of my Queen walk attacks, you can see how easy I make the strategy look like. But it isn’t easy. Especially at TH10 and TH11, it requires a lot of skill and understanding of the strategy, the Archer Queen, and the game to pull off a successful raid with her. While unlike the much easier strategies to pull off with a high success rate, the Queen walk is a high risk high reward attack that often rewards the skilled attacker. It is not OP, there are many ways to build your base to defend against her. I know because I’ve been designing bases for about 2 years and many of my designs are used by the many hundreds of thousands of Clash of Clans players. And many of us are finally learning to defend against her. In fact, I’ve had many ideas for new base designs to counter her. Ways to disallow her of walking, disallow her of simply targeting multiple Air Defenses or disrupting your double giant bomb placements. Many new innovative ways of protecting your Dark Elixir storage. Unfortunately, if the next update means the death of the Queen walk and Super Queen strategies, this will never happen. So again, I urge everyone to give the video a thumbs up and also post your comment below on your opinion of this, and w may be able to stop Supercell before it’s too late. Thank you for supporting this cause. And don’t worry, no matter what the state of the game is, you guys can always trust in me in finding more innovative ways to help you farm better, help you get those 3 stars in wars, design great bases, and all the contributions that I will continue to make in this game. So thanks for reading and supporting me, I’ll see you guys again soon. Later!